Waste Not! Want Not! Week 18…Washed up on the beach…Dead! | Retired? No one told me! Waste Not! Want Not! Week 18…Washed up on the beach…Dead! Over the past two weeks, two whales have washed up on shores—one in the Philippines, and one in Italy—with stomachs stuffed with disposable plastic trash. On March 16, a young Cuvier’s beaked whale died and was found in Mabini after having consumed about 88 pounds of plastics. Last week, a pregnant sperm whale washed up dead in Sardinia with a little less than 50 pounds of plastic in her stomach. The beaked whale was found in a state of advanced dehydration and starvation, while the sperm whale’s death has not been fully diagnosed. Now comes the kicker…the ban was put on hold until a referendum is voted on in 2016. Officials said that based on a random sample of 800,000 names submitted by the American Progressive Bag Alliance at the end of last year, opponents to the ban had mustered 555,000 names — more than the 505,000 needed to force a vote. On November 8, 2016, California voters approved Proposition 67, the statewide Single-Use Carryout Bag Ban. California proposes phaseout of single-use plastics by 2030…Wow, that’s some jump! What do you guys think when someone utters a statement like this??? However, some contend the state should stay out of the business of restricting plastics, whether straws or packaging. They also claim a small percentage of plastics in the ocean are coming from the United States. Freedom issue?…. Companies should be able to decide.?.. What planet apart from planet greed and money are these people on…It certainly isn’t the Blue Planet! Why can’t everyone be like the French? Banned from NOW…No arguments, no votes Just BANNED! Ostrich syndrome no longer works! PLASTICS are polluting our oceans. Two young Americans have founded something called 4Oceans – I’ve done some research and it seems to be on the up and up. For every twenty-dollar bracelet, you buy, made from recycled plastics in Bali, they promise to remove one pound of plastic from the oceans. They are located around the world and it seems like a good place to donate. The bracelets aren’t much, but then most of the money goes to the cleanup and the local Bali economy. Check it out. Patch’s hypoallergenic adhesive strips, perfect for kids and adults alike, are free of plastic, parabens, latex and silicon. Bamboo is a rapidly renewable resource that grows many times faster than trees, uses much less water, produces up to 35 more oxygen and doesn’t need pesticides or herbicides! The UK’s biggest coordinated beach clean-up, organised by Surfers Against Sewage, will see volunteers across the UK removing plastic from natural spaces including mountains, as well as contributing to the UK’s biggest ever Plastic Pollution Audit to help further track and tackle plastic pollution to stop it at the source. Thank you, ladies …You Rock! This entry was posted in Bioplastics, Green Waste, Health and plastic, Microplastics, No to food waste, Plastic and the inside of cans The Dangers, Plastic bottles, reuseable coffee cups, Uncategorized, War on Waste, Waste disposal, Waste not want not and tagged Blue Planet, Green Waste, Marine Life, Microplastics, Plastic bottles, War on Waste, Waste not want not, Whales on April 4, 2019 by CarolCooks2. Hi Carol If they had made plastic bio degradable when it was invented there would not be this mess today! Yet they blame us! Thank you for calling by and liking “Shadow People!” Do They really exist?#TheFoureyedPoet. 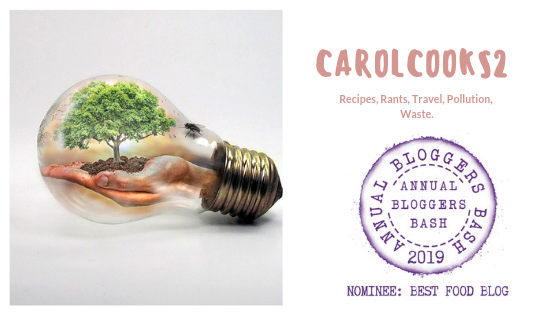 Pingback: CarolCooks2…Weekly catchup…Plastic, Cloud Eggs, B3, Komoto Dragons and Dare to Dream! | Retired? No one told me! I really have to be more conscientious about taking my reusable bags. Yes, that’d be a good idea. Leave them in the car. I buy loose produce wherever possible and regret the passing of independent shops . All packaging gets re-used and eventually recycled. As heart-breaking and maddening as the news is about how utterly disrespectful we humans can be to other species/ecosystems (plastic in whales’ digestive systems AND horrible explosives underwater which ruins their amazing hearing… while we greedily search for more fossil fuels, some of which will be turned into non-decomposing plastics!!!! ), I am slightly comforted by your blog post because someone else is upset about these issues. Thank you for caring and sharing your ideas about how we can make different, wiser choices! Carol Taylor with her weekly war on waste and continues with the use of plastics and its appalling impact on wildlife, including whales. It would also seem that it is mammoth task to move a bill through government with some taking 16 years to enact a ban that should be immediate.. well worth a read and getting your own dander up. That’s so sad about the poor Whales. You’re welcome about the links. I didn’t know about your alergy, but that makes me even more glad I sent you that one. Am I doing enough? I doubt it. But I’ll keep trying. If we all keep trying, maybe eventually it will be enough. Maybe, if enough of us try, the money-grabbing companies will even start to wake up and start trying too. Can but hope, right? I know. I read about it. It is so appalling.